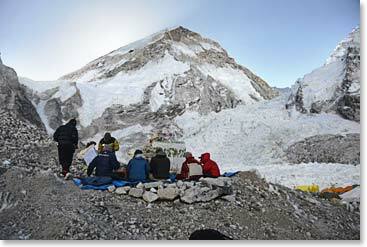 April 8th dawned clear, windy and cold at Base Camp. The trekking team has spent three nights here now, and today they will leave Base Camp with guides Min and Nuru and begin their descent back towards Namche, Lukla, Kathmandu, and home. April 8th is Todd Pendleton’s birthday, but we decided to celebrate last night, so that we could all wish Todd a happy 44th while we are still together. Todd loved the cake and he has been eyeing the mountain above since we arrived at Base. But we know that his thoughts are at home with Heather and his soon-to-be-first-born son who is joyously expected this summer in Arizona. 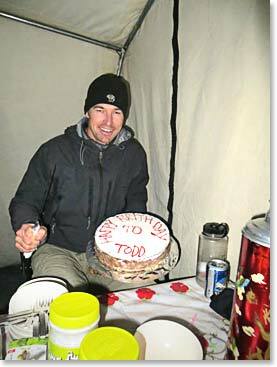 Happy Birthday, Todd and best luck with your climb! We woke up at about the same time this morning, but things were a bit different. A lama had arrived from Pangboche last night and he slept in our Yoga Lounge, so that he would be ready to go to work first thing this morning. 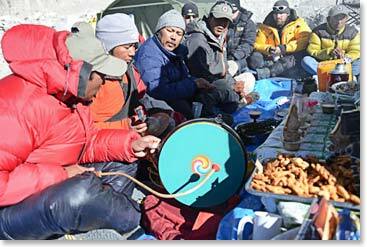 Sherpas always ask a lama to bless their team before they go onto a mountain and our climbers are more than ready to participate. 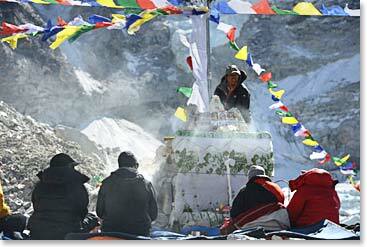 The trekking team watched on as the porters were loading up for the walk down to Pheriche. After about 1 ½ hours of prayer and offering, the trekkers were all chilly and ready to begin their walk, but at the same time no one wanted to leave! We have had such great adventures and fellowship together, it is difficult to part ways. 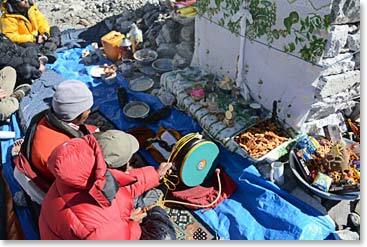 Our Base Camp looks complete now, with colorful prayer flags streaming from the chorten that is the center of our camp. The trekkers got to see this before they left; they will remain a part of this team throughout this season. 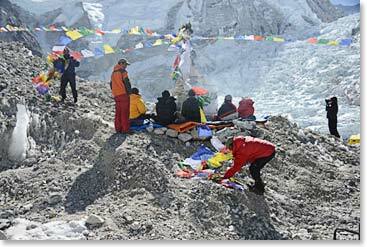 The juniper fire burns at the chorten and it will remain lit while we are on the mountain. 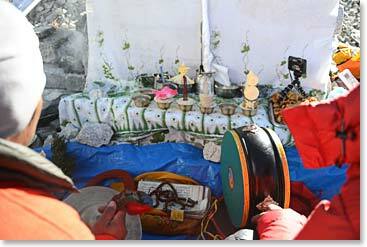 As the sun came up, preparations were underway to begin the Pooja. 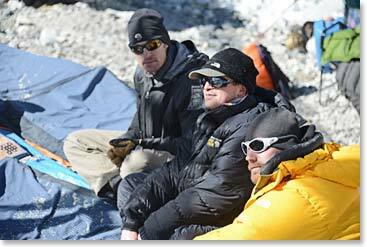 All our Sherpas and the climbing team members join in. 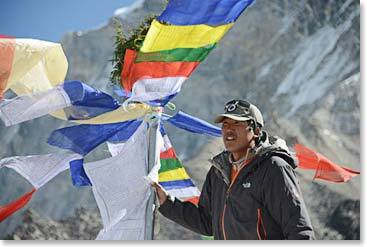 Dawa our lead climbing Sherpa, raised the flags from the chorten.